Cue the confetti – WooHoo!! Tyler and Brooke exchanged their vows yesterday at the beautiful Aston Gardens. It was so heart whelming to see all their family and friends gather around them and give them blessings and prophetic words of wisdom. This is certainly a wedding I won’t forget! I can not wait to dive into editing their images and getting some sneaks posted for you guys. But for now, more about Brooke’s Dallas bridal session. 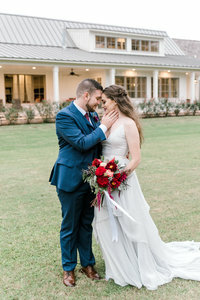 We landed the perfect day! It was a tad chilly, but nothing like the cold snap days we had been given. When we got to the park, it was packed. Beyond packed even. I so wanted to hang my hammock and join everyone with the sunny weather. We took off for a hike to the opposite of the park from the crowds and really utilized the less crowded areas. She danced, she twirled and she laughed – thats the making of a perfect session. The sun plus this girl gives my photographer heart all the feels. Her dress really is the perfect twirl dress. Yes, this is blurry; but ahhhhh I am loving it! Capturing a care free spirit is always the best, not matter the outcome. Life is blurry, so we must embrace those moments! What an adventure Tyler and Brooke have been on! Head here to see their engagement session, and stay tuned for their wedding blog soon. Love these two so much!